Comet 206094A. 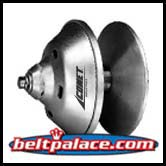 Comet Industries 94C Duster Clutch | Fits Engines w/ Tapered shaft, Honda Odyssey UTV/ATV. 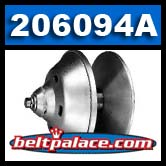 Home > Comet Clutches and Parts > Comet 205838A. Duster 94C 30MM Clutch Puller Kit > Comet 206094A. Comet Industries 94C Duster Drive Clutch. TAPERED BORE (30mm). Comet 206094A. TAPERED BORE (1:10, 30mm). Comet 206094A. Comet Industries 94C Duster Clutch “dusts” the competition! TAPERED BORE (30mm). Will work with drive belts 1-1/4" to 1-3/16” Wide. Arrives arrives assembled (factory) with six (6) Comet 205918A Pucks and Comet 205583A Orange spring kit. Fits Snowmobiles w/ Tapered shaft, Honda Odyssey UTV/ATV. NOTE: Comet 204799A adapter required for 25mm, 1:10 tapered shaft. Comet Industries’ straightforward design and legendary durability make the Comet 206094-A (94C) Duster clutch (30mm, 1:10 tapered bore) one of the most logical choices in the Snowmobile/UTV/ATV CVT market. Consistently outperforms OEM clutches costing twice as much that require more maintenance. Plus, it’s one of the easiest CVT Drive Clutches to install. Genuine Comet Industries “Duster” Clutch! Comet 205918A 3-Pack. Comet Industries 205918 Activator Pucks for 94C Duster Centrifugal Clutch System (Smooth Cover). Comet 205583A Orange Spring. Comet Industries 205583 "Orange" Spring. Comet 205583A Orange Spring Kit. Comet Industries 205583 "Orange" Spring for 94C Duster Centrifugal Clutch System. Comet 206514A activator pucks. One Package of 3 Pucks. Comet 206514A activator pucks. One Pack of 3. Spec: 7/8" steel insert. Weight: 53.5 grams.